A different kind of window treatment? Ive been thinking on what to do with the bare window in my office. Its an odd width and length which rules out ready made options. I don't want to spring for a custom made one - mostly because I'm cheap but also because I haven't seen anything I love enough that is worth $300+ dollars. It got my wheels turning on how I could make something like this work for me. I don't have the ability to do anything like this freehand but I could certainly design it on paper and then trace using paint pens. Obviously, I wouldn't do a coffee machine since that makes no sense. And I need something a little more solid to block the view a lot more. But maybe I could do a typewriter or some other office appropriate imagery. Or maybe a pretty pattern? What do you think? 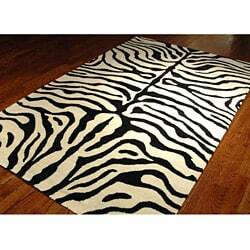 And then moving onto the floor, Suzie found this great Zebra pattern rug from Overstock for me. Again, Im being a tightwad here in holding off on spending this much money on something I really don't need. But that doesn't stop me from admiring it, does it? For the record, Im so NOT an animal print person. Not because I find animal prints morally offensive (I don't) but because I think then tend to look a little too garish for my tastes. But for some reason, I think this room needs something a little crazier than I normally go for. What do you think? Too much? The trend is over? I love what you've done with your office so far, but eventhough I do like zebra print, I think it may look too garish against the turquoise color of your walls. I would go for something more subdued, but that's just my two cents. I'm sure you'll pick something amazing given your fabulous taste. Check out Etsy for vinyl wall decals. They are inexpensive but they look great. You can find some really interesting ones. I think you should go with the black and white cowhide from IKEA. I think the real deal (if you're not morally offended) is so much more timeless and adds another level of texture to a space. I like the zebra rug, but maybe it's the colors in general that I like. You could always find an inexpensive black and white rug. I think you are on to something with the vinyl wall decals. However if you have access to a graphic designer/friend with Illustrator, you can design something the exact size of your window and have it printed for next to nothing. There are hundreds colors available including frosted etc. Then you can control the amount of light coming in and don't have an odd shaped decal in the middle of the window. I think the zebra rug would be fabulous in the office. Just enough to liven it up. But you do what feels right to you because you do have fabulous taste. I think plantation shutters on that window would look great. I love a little animal print in a room, but I understand that not everyone is comfortable with that. I love to be a thrifty shopper.My office rug was actually picked up at Home Depot for 79 bucks. Freckles Chick also has a beautiful rug that she got at LOWES and it's black/white. Oh and DESIGNYOURWALLS has a lot of great options for windows with adhesive vinyl glass coverings. she uses a zebra rug in her very formal living roof, there is a picture, and it is incredible. Cranny - I know how to use illustrator but where can I have something large enough custom printed for cheap? Im seeing pretty expensive sq foot charges for something like that. Do you have a source? I am sorry to confess, but I can't wrap myself around the aesthetic of animal prints. In fact, even my daighter walks by leopard print and proclaims it "tacky". My own little mini-me!! I know it appeals to many, however, but still, I think it takes away from the design of the room and all its other great elements. As for the window, how about frosting it, but leaving a design (small or large) etched in? I'm thinking a damask pattern, fleur de lis, chandelier, you name it...What is the view? If it's good, you likely won't want to block it. That's my two cents...for whatever it's worth! The view is quite ugly - so I want to hide it as best as possible without losing all of the light. I know what you mean about spending money. There is so much I want to do to the house right now, but with this economy I am tightening my belt big time. It is so hard to find beautiful and cheap things, even harder here where we don't have all your great stores and a weak Canadian dollar. I do have a source, but I live in Canada. Most sign shops do vinyl lettering. If there is a SignsNow where you are they will be able to do it no problem. Also, if you don't feel comfortable installing it, they will do that as well. I like the frosted glass idea. Then I would either stencil in (leaving the letters "clear" unfrosted glass) or paint in black letters in an old school font: Office. I went on a house tour and one of the homes was in an old firehouse...The original captain's office door (real frosted glass) was still in place, and they moved it to the room that they do use as the office. I loved it! I saved a photo from Jasper Conran's home years ago and he had a bold black and white stripe with a bold graphic, so I think if you were to do the zebra, adding another bold pattern would be fun.